This startup’s SaaS solution stitches together disparate meeting room devices and services for complication-free experiences. After all this time, you’d think there’d be a way to solve these issues. Our latest hope comes from ZiipRoom, a Burlington, Mass., startup that came out of stealth mode yesterday at InfoComm 2018, with big promises to make meetings better. ZiipRoom offers a vendor-agnostic software solution purpose-built for huddle rooms. Think of the product as meeting middleware that brings together devices, calendars, meeting room services, and endpoint hardware. ZiipRoom software, launchable from a mobile device, laptop, PC, or even a room system with a single click of the mouse or tap of the screen, is the brains of the solution. The app will prompt attendees at start time, then connect them regardless of back-end service. ZiipRoom supports a wide range of meeting/conferencing services, including BlueJeans, Cisco Webex, GoToMeeting, Microsoft Skype for Business, Zoom, and others. In addition, ZiipRoom is hardware independent, so most businesses would be able to use whatever camera and display is available in a room. Besides taking complexity out of joining a meeting, ZiipRoom addresses the guest user problem common with room systems designed primarily for internal users on the enterprise network. In such environments, guest participants — i.e., anyone who isn’t on the network — can’t “see” the system or present content to it. This can be frustrating for guests, who must resort to either plugging into the network with a cable or sending documents to share via e-mail. ZiipRoom, as a cloud-based service, solves this problem by treating non-employees as guests with full access so the experience is as seamless for them as it is for internal users. 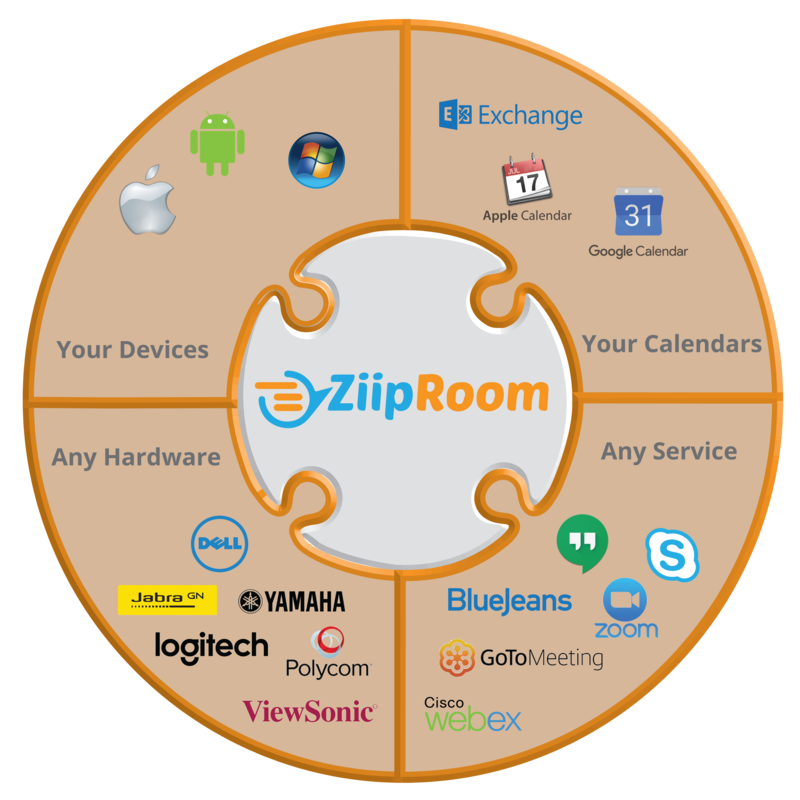 ZiipRoom’s solution is similar to Cisco’s Webex Room and Microsoft’s Skype Room System products. However, the Cisco and Microsoft solutions require new hardware, whereas ZiipRoom’s doesn’t. Cisco’s approach is fully turnkey, and Microsoft uses partners, but both require deployment of new hardware to make the experience seamless. Each approach has its pros and cons. In theory, a full turnkey solution in which all the pieces are designed to work together should provide an optimal experience. However, ZiipRoom seems to have licked that problem through its software. In a pre-briefing, the company assured me its vendor-neutral technology delivers a seamless meeting for users. I’ve seen demo, and I do believe ZiipRoom’s claim is plausible. Nevertheless, the company will face a challenge down the road. The reason the Ciscos and Microsofts of the world are building turnkey solutions is, first and foremost, to deliver a great experience today with the stuff they sell now. But their eyes are on the future. As more workers use their systems, they collect more and more data, to which they can apply advanced analytics to create innovative experiences — think of artificial intelligence and the Internet of Things. For example, a Cisco Webex Board uses facial recognition to recognize you as the meeting host, then applies AI to set the temperature to 65 degrees and close the blinds because it’s learned that those are your preferences. While ZiipRoom is working on facial recognition and other advanced features, it’ll face a difficult challenge in aggregating, normalizing, and analyzing data from several systems. I’m not saying the company can’t do it, but keeping pace with innovation from turnkey solutions providers won’t be easy. However, that’s down the road, and ZiipRoom just launched — and the upside for workers and organizations today is huge. Enterprises haven’t previously had the option of having one system that enables them to retain their investment in current meeting room technology while providing the freedom to choose whichever on-line meeting provider they prefer. Also, because ZiipRoom masks all the underlying connectivity and complexity, an organization could switch providers without disrupting or having to retrain users. As part of the launch, ZiipRoom announced it had joined Logitech’s Collaboration Program, to enable deep integration with its systems. Given Logitech’s momentum, having its stamp of approval doesn’t hurt – but wasn’t absolutely necessary. One final note, ZiipRoom pricing is $299 per room, annually — no bundles, packs, or optional purchases. That “all in” price seems reasonable, and should make this solution affordable across the board. Everyone loves to hate meetings because the experience is generally so terrible. Companies that want to turn meeting spaces from places of frustration into places for productive work should look into ZiipRoom, especially since it will allow them to deploy quickly while preserving existing investments.